Tae Kwon Do helps create order inside an individual. Someone who feels in order also feels that they have the freedom to be able to cope, to love and to understand and demonstrate compassion towards others. Within the discipline applied to training is the freedom of having control over yourself. When you achieve this control of your body, you have laid the foundation of confidence to make your spirit unshakeable. In order to attain this tranquility you must first experience some agonies. For instance, when you first free spar or attempt to break a board, you learn first hand what it is like to have conflict face you. You must face this conflict head on in order to achieve success and to grow. Tae Kwon Do thus teaches us to deal with conflict. Many times as you train you will become frustrated and angry. Some techniques or forms may be difficult to master, sometimes we may be working through an injury or not feeling so well and training becomes difficult. There may be outside conflicts with our training such as problems with family, work or school. By perservering with our training we learn to focus, to place priorities on what is most important and to eventually achieve success. 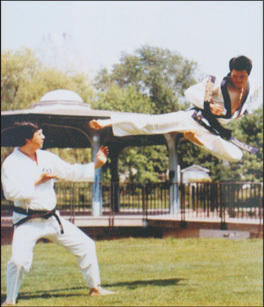 This brings us to the essence of the Martial Arts being a union of the mind and body. I wish you the best of luck in your adventure with Tae Kwon Do and wish to let you know that as your Master Instructor, I am here to offer you assistance in any way that I can. Please feel free to talk to me about any problems or concerns you may have during your time at Eagle Martial Arts. I hope to see you achieve your goals, whatever they may be.